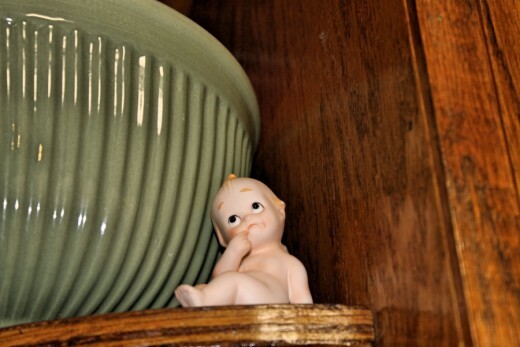 I already showed y’all the first Kewpie Doll I found. She sits on the shelf in the kitchen next to my Big Green Bowl that my sister gave me. 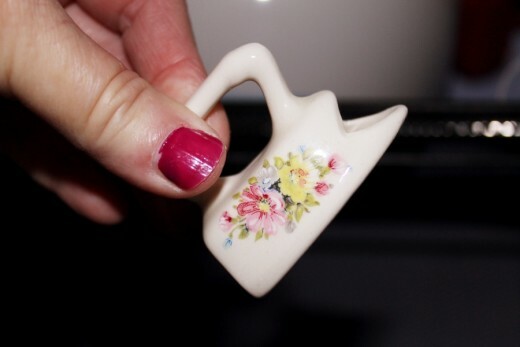 I found another one, just as cute, a couple of weeks ago at a different thrift shop. 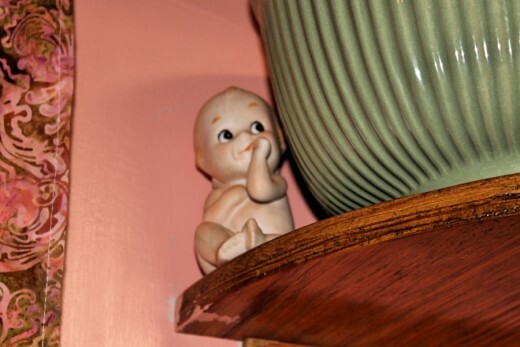 I put the new Kewpie Doll on the other side of the same shelf. They are too cute up there. This Kewpie is a little bit bigger than the first one, and seems to be sucking her thumb. My granddaughter says she is creepy looking. What do you think? 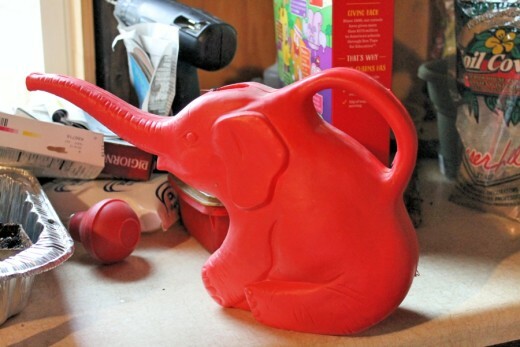 Who would be able to walk past this red elephant watering can? I couldn’t. It is just so cute sitting on the shelf on the front porch, or on the work table on the back porch. And when you water plants with it, the water comes out of it’s trunk. Too dang cute! Fabgrandpa found this spotted frog ceramic figurine last weekend at an antique shop in Oxford, Alabama. 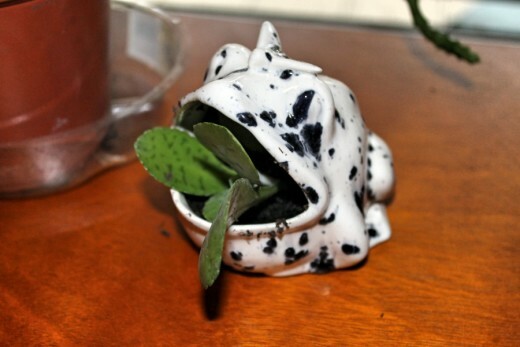 As soon as he got it home, he planted a succulent in it. It makes it look like Froggy is sticking his tongue out to catch a fly! He just told me he paid $10 for it!!! He did also say that he paid way too much for it. That, my friends, is the difference in a thrift shop and an antique shop, LOL. This is a really good find for us. 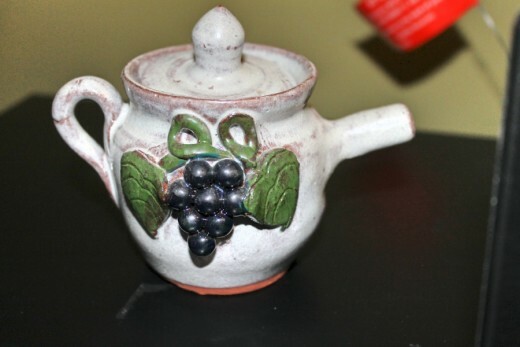 It is a piece of Meaders Pottery, and we found it in a junk store in Cleveland, Georgia a few months ago. It is only about 6″ tall, but has a lot of detail in the decoration. I think we paid $25 for it, but it was well worth that price. Sometimes you just have to do it. The last thing I have to show you this week is a tiny ceramic iron I found for $1 at a thrift shop. I put it in the shelf in my sewing room. That’s it for this week. What did you find? Any real treasures? Did you pay way too much for something just because you liked it? That elephant water can is adorable! The elephant is the only thing I would want. Not into knick knacks. I’ve gotten both good deals and paid more. Don’t see Kewpie dolls much any more. Love anything elephant. I love the iron ad the tea pot and the elephant.